Through air or a vacuum, most light vibrates in all directions perpendicular to its propagation direction. When light is reflected off of a surface or passes through most minerals then the light is limited to vibrating in particular planes, and is said to be PLANE POLARIZED. A polarizing filter is a material that selectively blocks or passes light waves. It absorbs all of the light, EXCEPT for light that vibrates in ONE particular plane. Thus light that passes through a polarizing filter is said to be PLANE POLARIZED. Most minerals also polarize light. When light passes through such minerals (collectively known as ANISOTROPIC MINERALS) the light splits into two beams that vibrate perpendicular to one another, neither of which is parallel to the vibration direction of the light that entered the mineral. In addition, the two split beams travel at different velocities through the mineral. 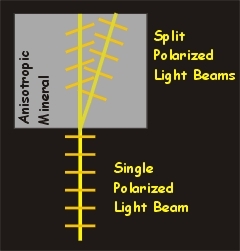 When the polarized light wave splits into two waves in an anisotropic mineral, the vibration directions of these waves is dependent upon the vibration direction of the incoming wave. Light is a VECTOR, that is, it has both a MAGNITUDE and a DIRECTION. (Other vectors that you may be familiar with from physics are force and velocity.) Thus when adding vectors together you must take into account their direction as well as their magnitude. 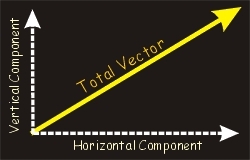 Vectors can be broken into components. In the example to the right, the TOTAL vector (diagonal) both points up and to the right. 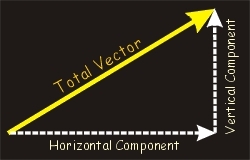 Accordingly, the total vector can be thought of as having a horizontal component and a vertical component. In other words, placing vectors tip-to-tail results in the ADDITION of the vectors. To understand how light vectors split and recombine you must understand this geometric method of adding vectors! 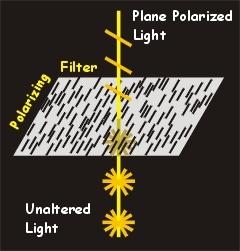 Just above the light source on a polarized light microscope is a polarizing filter called the POLARIZER. This filter is fixed in place. 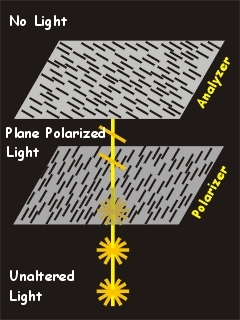 Thus the light beam that reaches the mineral sample on the microscope stage is always PLANE POLARIZED. In the photo below, the polarizer is attached to the silver dial. 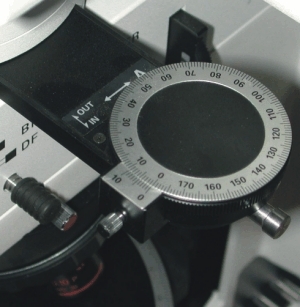 The tick mark in the front and the degree measurements labeled around the ring allow the operator to make sure that the polarizer is properly positioned. 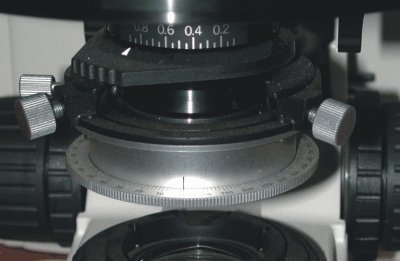 A second polarizing filter is located in the body tube of the microscope above the objective lenses. Thus, this filter, called the ANALYZER, affects the light after it has passed through the mineral sample. The analyzer is moveable so the microscopist can insert or remove this filter from the path of the light beam. In the photo to the right, the analyzer is attached to the black arm projecting from the microscope. Moving this arm allows the analyzer to be inserted or removed from the light path in the microscope. The labeled degrees around the silver dial allow the operator to maintain the position of the analyzer such that it passes light perpendicular to the polarizer. The ANALYZER is oriented perpendicular to the POLARIZER. That is, the polarizer only transmits light that vibrates in one plane and the analyzer only transmits light that vibrates in the perpendicular direction. When the analyzer is inserted the light is said to be CROSS POLARIZED. If light passes from the polarizer to the analyzer without being changed or affected by passing through an anisotropic material then no light will pass through the analyzer because all of the light that reaches it is vibrating parallel to the microcrystals within the analyzer!